Over the past few days I've been working on weapon and skill balance. In addition to the Newbie Checklist and the free skill resets for players under lvl 30, I think that rewording all the skills is a really important step. The skill system is the heart of Mutant Factions and new players need to be able to not only experiment with it, but actually UNDERSTAND it as well. So I'm going to reword and organise all the skills. It's very easy to see what the skill does now. How it helps you and how it hurts you. You'll also notice that I've stripped out the "story" aspect of the skill. It no longer talks about the "vampiric mutations in your blood". I know some people like this stuff but at the end of the day MF isn't a story-driven game. It's a competitve shooter with a complex skills system. Clarity and understanding are most important and the skills are complex enough as it is. Adding story elements simply makes it harder to read with little benefit. Anywhoo the new skill system is looking to be a lot more newbie friendly with concise skill descriptions and unlimited resets. Much easier to explore and experiment! Create 3 temporary shield plates around yourself that absorbs most incoming gun damage. Penalty: Shields explode after some time, hurting enemies and stunning you briefly. Cannot be used with objectives. Absorbs 80% of incoming base damage. Activate an armor that briefly reduces enemy weapon damage you take and increases your movement speed. Penalty: Enemies can overheal beyond their max health by hurting you. On killing an enemy, unleash all red charges, causing his corpse to explode into one damaging parasite per charge. 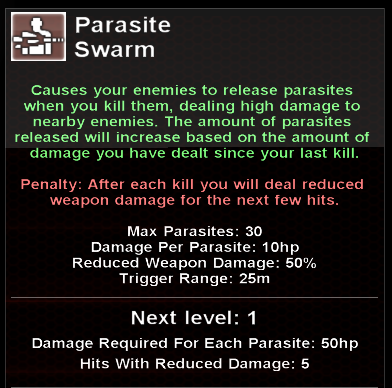 Penalty: You gain blue charges on releasing parasites, forcing you to deal less weapon damage for your next few hits. Go berserk, increasing your rate of fire every time you hit an enemy. Penalty: Your location is always revealed and easily tracked as long as Frenzy is active. Fire a dart that poisons an enemy and tracks his location. Penalty: Poisoned enemies deal increased bullet damage. Emit a wave of electricity that freezes projectiles, disables enemies' barrier and tracks their location. Penalty: Shocked enemies take less weapon damage. Enemies you shock emit sparks whenever they take damage. Penalty: Enemies you shock shrink in size, making them harder to hit. Enchant your gun, increasing its bullet speed and makes it last longer when dropped. Penalty: Energized guns drain more ammo per bullet fired. All energized guns you use shoot bullets that pierce through enemies and ricochet off a wall. Penalty: All energized guns you use take longer to reload. Summon an orb that gives a chance to deal critical damage and follows you when you use barrier. Penalty: Slows your non-barrier movement to a crawl and regenerates mana of anyone inside it. I like the rewording much. The combination of the description together with the listed stats should describe the skill fully. So if they complement each other, this will be the perfect way to reduce redundancy and save words. The descriptions are you propose are really intuitive, except Parasite Swarm. Maybe the mechanic is too complicated, I mean why does there need to be a negative charge? Can't the player just glow blueish upon releasing those parasites making it clear that there is a (negative) effect present? Would be a lot easier. Creates 3 force fields that surround you and reduce incoming bullet damage. After a short time the force fields will explode outwards and damage nearby enemies. Penalty: The explosion will briefly stun you and stop you from moving. I quite like this format. No story, no long-winded sentences. Just short and concise, describing the 2 benefits that you get, and then the penalty below. This really was great idea you had STM as the timing works perfectly as I'm having to redo all the translations anyway. I think it'll make things a lot easier for newbies (and vets even!). Also reading your descriptions it's got me thinking that maybe an extra section could be used for really specific information. Like with Force Fields 95% of players aren't going to care if the damage is split 50 to 10 or 40 to 10 or whatever. They'll just know that they take 20% incoming bullet damage and that their Force Fields will take some damage too. But maybe I can have a little question mark icon as a roll-over or something that lists all this really specific information. The kinda stuff that clogs up the general description of the skill but is useful to know anyway. Just a thought, might not be worth it though. I'm not sure how many skills would need this extra information to be shown. I might just try squeese these things into the already existing list of number stats. I assume the way the new FF/AA dynamic is that if you have AA up while FF is active and you take damage from FF, the enemy overheals at 20% rate instead of 100% from direct hit or the previous 0% of not hitting at all. It's still at 0%. The bullet never actually hits the player. It simply hits the force field and then the force field transfers 20% damage directly to the player. Think of it as if the Force Field is pushed back into you and that hurts you a bit. So status effects don't apply. 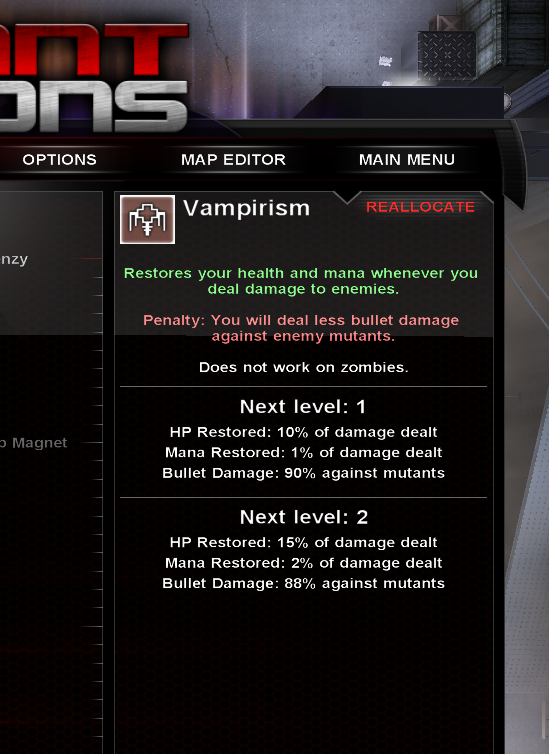 Very important to state that the penalty doesn't just heal 100% of damage taken, but also overheal beyond max health. Yes definitely, the overheal is key. Good point. This kinda of wording is important. I'll post up my descriptions shortly. Thanks! And yup, the skill is quite complex. When I get to rewriting it I'll see if it needs changing. it's designed that way for a specific reason though. But we'll see. 1) Separate the benefit and the penalty. Even if it's the same amount of words it's soo much easier to read when it's split up into 2 paragraphs which very clearly indicate what helps you and what hurts you. 2) Structured the benefit as more of a description instead of a command. I've done this by ensuring that every single skill starts with a verb. This is nice and consistent and reads nicely. Something like "Vampirism" - Restores your health and mana... can basically be read in your head as "Vampirism restores health and mana". You can see I'm still talking about a "vortex". This sounds kinda storyish but it's necessary to fully explain how the skill works because the vortex actually exists in the game. It affects who gets slowed and at what point the bullets start seeking towards you. 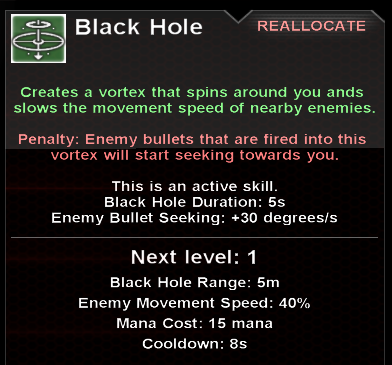 I could have halved the description by simply saying "slows the movement speed of nearby enemies" and omitted the vortex part. But then you wouldn't have as clear a picture of HOW it slows nearby enemies. Is it fixed on the ground like Stagnation or does it follow you? It would also be difficult to describe the exact mechanic for how enemy bullets seek in towards you. Anyway this is a bit of a balancing act but considering how short the description is anyway I think it makes things easier to picture and understand. In the very first sentence you know that this is a damage skill and have a gist of what it's all about. Killing enemies will cause damage to other enemies nearby. Sweet! Compare this to the old description where you don't know what the actual benefit is (damage) until the end of the 3rd sentence, halfway through the description. You'll also notice that for this skill I have had to cut out a bit of the technical detail and leave that for discovery once you actually use the skill. Notably I omit the fact that this doesn't trigger unless another enemy is nearby. This is implied from the trigger range that STM suggested, but also not all that necessary to know about anyway. So while technically you can kill an enemy and NOT suffer the penalty, I still say "after each kill you will deal reduced weapon damage" because it's very easy to understand and basically sums up how it works. I simply don't bother to list the exception as it'll become self evident when you play with it anyway. Really the whole point of this rewording is to make the general gist of the skill as easy to understand as possible. I was too obsessed with technicalities before and trying to stuff them all into the descriptions. Basically we want a brand new player to be browsing through the skills and get a good feel for what it does as easily as possible. If something grabs their attention that's great! They can unlock it and experiment with it due to their unlimited respecs. Hopefully this rewording combined with the free respecs will encourage a lot more experimentation and skill diversity in the game! Anywhoo, here is a bit list of translations if you guys wanna provide feedback. I'm pretty happy with it all but I might have made a few errors here or there. Havent had a chance to look throgu all of it yet but looks great! Minor note make sure range indicates radius as that can get confusing rsther than diameter. * "Active toggle skill" for skills that can be turned off to show that this skill can be uncast to turn off. I am always a little annoyed that newbies tend to just leave their skill running until they completely burn out. Later below, invisibility's benefit description words a bit too specifically to imply being able to uncast it rather than forcing you to shoot to turn it off. Bullet Time can be turned off. Blade Fury can be turned off as the description implies it just renews the blades like in the old days rather than burst first and then cast again to renew. Energize can be turned off, not too worried about the "owner only can enchant" since the orange mark is something you figure out later. So on and so forth. My only question is, should Force Fields be classified as "active toggle" because you can uncast it during the last second? * Microvolt wording. I want to stress that Microvolt is a status effect that is applied by your own shockwave, but any damage they take, not just from you, will cause sparks to emit. I didn't do this as it's not exactly true. Only players who have microvolt unlocked will create sparks. Now you are guaranteed to have it if you're using the skill, but your allies are not. Some allies might have microvolt, but the majority of them won't. So I defaulted to just talking about your damage as that's 100% true, instead of saying all damage which is false. Technically I could say you and any allies who have microvolt will cause sparks, but that's getting unnecessarily wordy I think. Causes shocked enemies to emit sparks whenever you damage them. Causes shocked enemies to emit sparks whenever they take damage. This is not true. Only true if you or the attacker happesn to have microvolt.